Take your meeting to new heights and treat your attendees to dazzling views of the Loop, Lake Michigan and more. Zoom up the elevator to the 13th ﬂoor of the Chicago Athletic Association Hotel for priceless terrace views and seasonal drinks and shareable plates at Cindy&apos;s.
I|O Godfrey Lounge offers al fresco dining and drinking on the fourth ﬂoor of The Godfrey Hotel, a Cubist-inspired, 16-story property in River North. 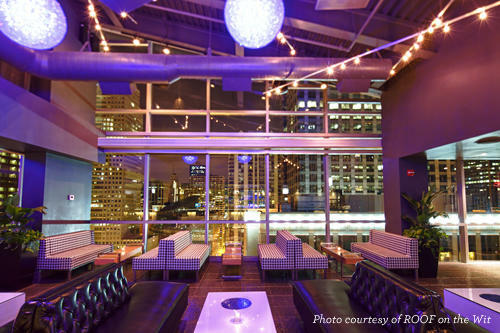 I|O boasts one of Chicago&apos;s largest year-round retractable outdoor lounges. Savor glam city views, gastropub fare and handcrafted cocktails at 52Eighty Rooftop Lounge on the 29th ﬂoor of Cambria Chicago Magniﬁcent Mile, a new boutique hotel near Michigan Avenue. With more than 20,000 square feet of function space, Trump International Hotel & Tower Chicago also presents unparalleled views at Sixteen restaurant (on the 16th ﬂoor), the chic REBAR and The Terrace at Trump that seats 200. At Hyatt Centric The Loop Chicago, head straight up to AIRE, a rooftop lounge with chic ambiance, fun décor, seasonal small plates and a large menu of craft cocktails and wines. 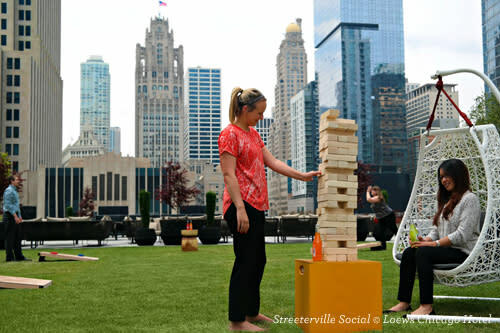 Situated near the Chicago River, the 52-story Loews Chicago Hotel is home to Streeterville Social, one of the city&apos;s largest rooftop terraces with multiple bars, a grassy lawn area with games, lounge-style seating and big views. If it&apos;s sweeping views of Lincoln Park and Lake Michigan you&apos;re after, The J. Parker can&apos;t be beat. Nestled atop the Hotel Lincoln, guests enjoy expertly crafted cocktails and upscale bar bites like cheese fritters and shrimp ceviche, all under a retractable rooftop. 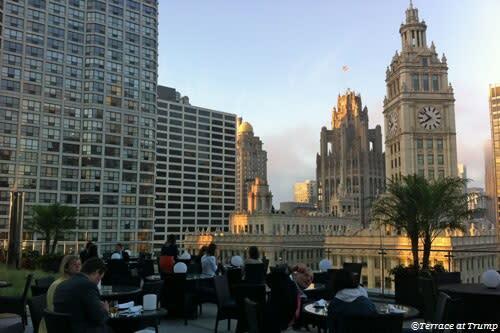 One of the most perpetually popular rooftop destinations downtown is, unquestionably, ROOF on theWit. The slick, splashy year-round space offers ample views of the Loop and the Chicago River. Bottle service, a substantial champagne list, punch bowls and martinis are the tip of the drink iceberg, while seafood towers, sushi rolls, and macarons headline the dining menu. Cerise takes up residence on the Virgin Hotels Chicago&apos;s rooftop, revealing views from three sides. The 26th-ﬂoor lounge is a chic destination with pillowed couches, DJ-spun music and summer events like the Daylight Disco monthly afternoon party.